What If You’re Not An Expert, Never Made Money Online And You Don’t Believe Anyone Will Pay To Learn From You? I want to sign up for your course, but I’m worried it won’t work for me because I don’t have a topic. I’m not an expert and I have no idea how to figure out whether the subjects I am interested in can lead to a profitable online business. I’ve noticed most people who make money online seem to do so by teaching how to start a business, or how to sell things, or how to do branding or marketing online. Is it possible to make money in non-business subjects or is it really just a big pyramid scheme, with people only making money by teaching how to make money? Ugh, that’s a depressing thought. When you first begin to learn how to start an online business it’s quite easy to get caught in an ‘echo chamber’. An echo chamber is a room where the same messages are repeated over and over again, seemingly bouncing off the walls and coming back to you again and again. The problem with the ‘make money online’ niche is that everyone is teaching similar things, and often recommending other people who also teach similar things. It’s all about how to get traffic and grow your list, or how to grow your brand online, how to launch a course, or how to do webinars, etc. When you start listening to one expert you will then learn about other experts, who then guide you to others. You can quickly . This becomes even worse when you stumble upon income reports on blogs, or hear stories about six-figure webinars, or the big money being made on YouTube, Instagram, or Facebook. It seems like everyone else is making money, and they’re all doing it by teaching how they make money! In the make money online niche the key way to demonstrate you are the real deal is talk about how much money you make. If a person is running a business that teaches how to play tennis, or to learn the guitar, or recover from an abusive relationship, it doesn’t make sense for that person to talk about making money or marketing. In these industries the success metric is very different. Since they are not in the business of teaching how to do business, you won’t hear their business stories. That’s unfortunate because often these entrepreneurs are doing amazing things when it comes to marketing, but since marketing is not their business, they don’t talk about it publicly. This is why it’s a lot more common to hear business success stories from experts who teach business. This is also why it quickly becomes an echo chamber and can seem like one big pyramid scheme, especially if you’re feeling disenchanted with internet marketing due to your own less-than-stellar results. It’s because of this sentiment that many years ago I stopped publishing income reports. I decided it would be better for my business to shout about the stories of the , people who have taken my course and gone on to make money in OTHER niches. making a full time income from a blog about skiing in Bulgaria. using her blog about television production to get clients and speaking opportunities. growing and then selling his blog about home loans and being a real estate agent. And creating a blog and online course about speed reading. All of these people used the blogging system I teach to make money online, but they do not teach how to make money online. There are . But Wait, Why Not Teach How To Make Money? There’s no reason why you can’t jump on the bandwagon and also make money teaching subjects related to running a business and making money. However it only works if you actually know how to do something and have results to back it up. If you’ve succeeded with pay per click advertising, social media, webinars, video marketing, personal branding, blogging or any valuable skill related to business, there’s still lots of money to be made teaching others about these subjects. Chances are you’ve never made money or have any business skills you can teach, so you need to look in other areas for your potentially profitable topic. Why Would Anyone Pay Money To Learn From You? If you’re feeling lost because you don’t believe anyone will ever be willing to pay money to learn something from you, thus you will never have a successful ‘laptop lifestyle‘ business, don’t despair. The important thing to realize is that people will pay for education from you, and you only need to know just a little bit more than they do. Beginners Need To Be Just One Or Two Steps Behind You In Order To Benefit From What You Know. I suspect right now you actually do know enough about a subject that you can start a blog based business if you make the decision to focus on teaching beginners. Beginners just need to be one or two steps behind you in order to benefit from what you know. Beginners are everywhere. While it might seem like the internet is already crowded with information for beginners, you’d be surprised how you can enter a ‘crowded’ market teaching beginners and make a lot of money simply because you’re a much better marketer. How do you become a better marketer? I can teach you. That’s why my program exists – to teach you how to become much better at selling your products and services online than most people. Most people I know who get stuck in a never-ending ‘I can’t find my topic‘ phase are trapped at the first question. They spend all day thinking about what they would like to help people do, they never bother to go out and find out whether people actually spend money on that kind of help/information. The challenge here is that you need a mix of both steps to gain enough clarity to move on to a testing and validation phase. You can’t figure this out just by pondering your own skills, interests, background and experiences all day long. No amount of sessions jotting down lists, brainstorming or taking walks reflecting on your life will get you to an answer. You need to actually step out into the world – at least the world wide web – and find out what is the current state of the marketplace you might enter. Only when you combine knowledge about yourself and the current status in the industry you are considering building a business in, can you come to a potential topic you can make money with. I created a course called the ‘Blog Money Finder‘. It is specifically for people who do not have a topic yet and have struggled to figure out what niches make money. Normally this course , but it comes as a special bonus (free) when you sign up for . 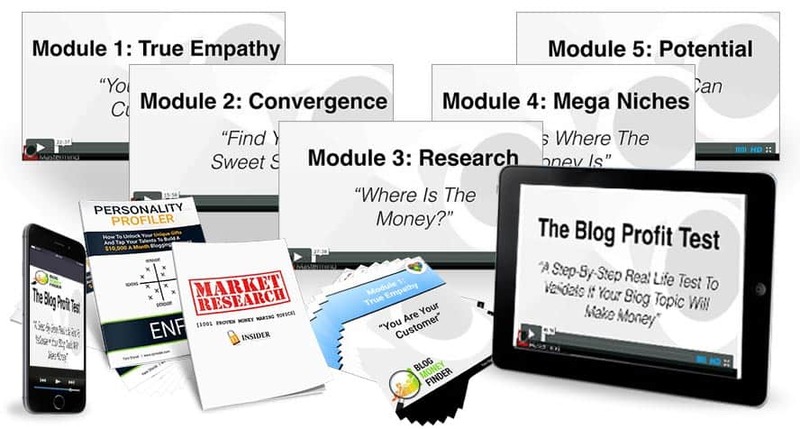 The main training in the Blog Money Finder are five video modules (also available as audio MP3s and text transcripts), where I hold your hand through a research process to identify, refine and then validate the right topic for you. The other key step in the training is a refinement process you must work through once you identify a market. Unfortunately most people choose a topic for a business from only one point of view – their own. The real secret to making money online, especially when you are planning to sell teaching/education products, is to understand the people in the market on a deep level. I call this level of awareness about the people in your industry ‘True Empathy‘ — Understanding the emotions, desires, fears, motivations and conversations going on inside the head of the people you want to help. Can You Really Empathize With Your Target Audience? Most people don’t have a deep enough empathy, which results in creating offers that simply do not appeal (and thus never sell). If you want to grow your blog and email list, and then sell products, you need to use powerful language. If you don’t have True Empathy, you don’t have the insight to know this powerful language. 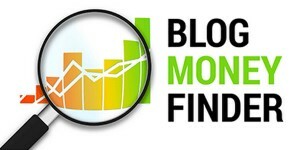 The Blog Money Finder also comes with two bonuses (which you also receive for free with ). The Personality Profiler is a personality test + guidebook to help you interpret your test results. The purpose of the guidebook is to help you identify what you inherent strengths and weaknesses are as they relate to starting and running an online business. You might not realize you have a specific blockage that stops you from success that’s part of your personality. If you don’t become aware of this block and take steps to overcome it, no amount of education or willpower will get you the result you want. This 120-page report is market research done for you. It contains 1,001 proven money making topics based on the work my team did to analyze best selling products online. There’s no guessing here – this bonus gives you the markets that already make big money online. is designed to teach you how to create a blog + email list focused on one goal = to sell your products and services on autopilot. The Blog Money Finder bonus training is designed to help you find a money making topic you are uniquely positioned to succeed with because you have a strength or advantage. 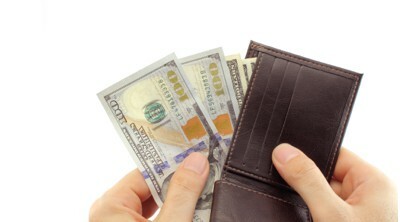 You get immediate access to the Blog Money Finder as soon as you join . If you’re willing to do the research and you’re motivated to share your knowledge once you find the right audience, you too can build a laptop lifestyle business. It’s not going to be a quick process, but committing to the entrepreneurs journey can be the most rewarding thing you will ever do in your life. I think this is a great post for 3 reasons. 1) People get so far, and then give up. 98% of people do not really take the time, to realise you are building a business, not just a money spinner. If you build a money spinner, you are not going to last in this game. 2) People are sick of the gurus, In a way, they would rather learn from someone, who gets results, and wants to share as the ‘little guy’ out there. As the little guy, you have much more power, and less skepticism. People gravitate to gurus, but its the little guy that can show proof and be helpful, and do the soft sell, that can work even better. 3) You are your worst victim. None-the-less, people actually think you can push a button and get 1 zillion dollars to your inbox by tomorrow, but that does not work. It takes, hard work, patience, and dedication to have a working business. I was actually able to go from $50 a month to $7000 per month, on average by doing little things each day. And over all remembering to build a client list. You bring up some fantastic points. It’s hard to push yourself to fight the negativity and continue down that road. Most people will try and then eventually quit. It’s human nature. It’s those that face adversity and fight through it that become successful. Thanks again for sharing this. Great article, You have teach me a lot with your clear explanation on things! Thank you! Hey Yaro, First of all, this is definitely an informative post, I’ve seen no place else so far. You’ve shared an insight which was due for all of us. I’ve been in a network of few online marketers who earn millions but never come out and share their experience and key tactics. So, it’s tough to find a right mentor. Beginners are everywhere – especially on the Internet. Heck, that is why we are searching, because we are beginners. 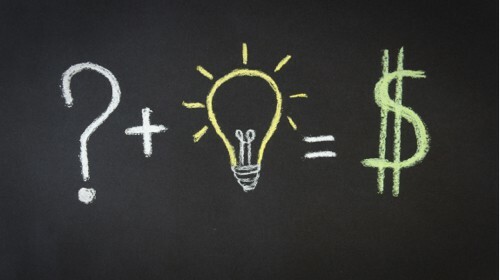 Great article and some valid points on how to make money off one’s knowledge. I love your success stories section! Two things I take away from reading this post – first, don’t start a make money online blog if you have no proof to show your audience you’re actually making money yourself. People will only take you serious when they read your success stories. Second, don’t wait till you become the “guru” before you start selling your knowledge, everyone is just one step ahead of another. But selling is not easy Yaro? People need some proof that you’re actually doing it yourself. Is not just in make money online niches, I guess is in every industry. People want to read your case study on how you drive 100,000 unique visit to your a day old blog before taking you serious on selling them website traffic generation course. People want to read how you write that one landing page copy that put hundreds of email subscribers in to your mailing list. I think the main thing is to develop your skills, practice what you preach and like you said, sell it to those who are two steps behind you. 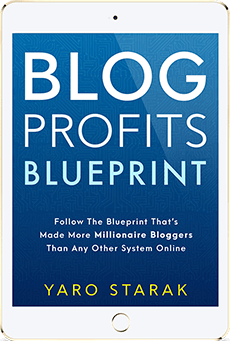 I was magnetically drawn to your post by the very clever post title that really does capture your imagination about just what is Yaro going to say about the potential of beginner marketers. Many thanks for sharing your awesome expertise in a way that not only educates but also encourages new online marketers who so many times are simply blown away with the enormity of the challenge about trying to make some money on the interent. Beginners are looking for guidance and more importantly looking for someone they can trust and this post gives them both as you very effectively guide folks along the journey of them self discovering the advantages you offer with Blog Mastermind. Any bloggers and internet marketers who are providing some sort of coaching offer to beginners to make money online must also undertand that this target audience is not just huge but in many ways completely fractured. What I mean is that so many of these beginners trying to earn their first dollar online have no idea of basic business and marketing skills AND no idea that they need these skills. So there is a real opportunity for more “experienced and successful marketers” to SHOW why you need to have these skills – and then provide (or offer) simple, easy to understand and implement steps to success for these folks to follow. Get the basics right for internet marketing or affiliate marketing or video marketing – whatever – and then the money issue will take care of itself. Their sites send out a message that is all about them and what they offer – NOT about that new beginner visitor to their site who is already feeling lost and overwhelmed. Get the basics right for internet marketing or affiliate marketing or video marketing – whatever -and then the money issue will take care of itself. Thanks for sharing your experitse on this vital topic for so many folks – was delighted to share this as widely as possible as its so important. Thanks for your feedback Peter. You make a good point about the fractured nature of the beginner market in internet marketing. I’m still amazed how many people are successfully making money teaching internet marketing now (all teaching basically the same thing) – everyone is forming a tribe and making a living from it, which is great. This is definitely an Interesting read. I cam here looking for something else but now I have bookmarked it. Some useful stuff here! that’s a wonderful kickass motivation article! I’m from Germany and we have kind the same Problems, like you People. Specially the making Money, Business and investing niches are full and you have to fight for your Position. But who cares. 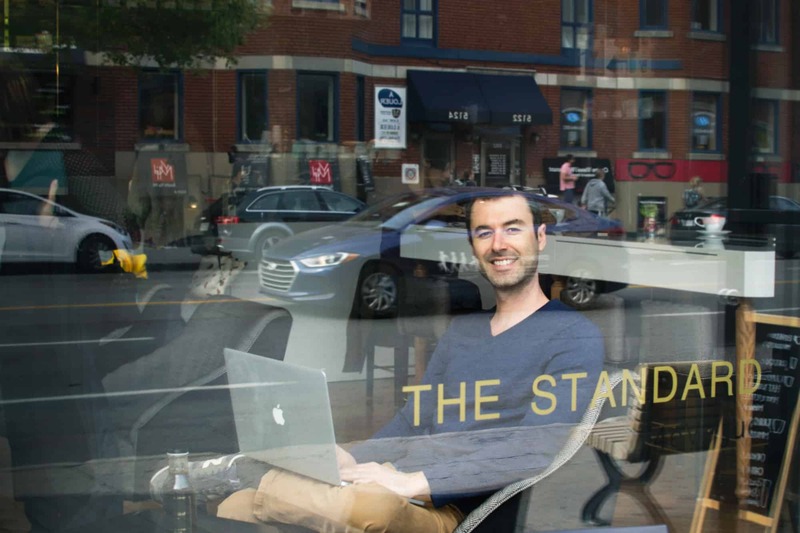 I started my own Business blog, without even knowing much about it in the beginning. You are learning by doing. They’re always People that Need to hear stuff directly from you and not someone else. Their will always be listerners and new People to the subject. Slowly my blog is climbing up the Google letter, abp- always be pushing. In Germany + Austria u maybe have not so much Blogs, like in the english speaking room, but also not so much Reader. So it’s quasi proportional. So the first 2 years u Need to work, without even getting paid. It takes a while, to get paid off. I’m sure in the early days it was easier. But So what. Better start know than never. I suffered a lot to make my first money online! I am more confused with this niche – Make Money Online. Being a newbie who has decided to teach others to make money online, is it valid. I have lots of information and even I have earned 50$ but not scaling up. Who wants to learn from a newbie to learn to make money online when that newbie himself / herself is learning. Information(My blog) + products(on making money online) = ? Will the above question mark turn into dollars? Why will people want to learn from someone who has not yet had results to show but has a lots and lots of information about the niche. Great post here. I definitely have to work on this mindset with my clients as well. The biggest issue you hit on–they don’t value HOW much they know about the stuff they know. THERE is wealth in that information, but they discount their own knowledge, greatly. Keep up the great blogging. I hope your mastermind was a success! I’m so glad you posted this! I specifically target beginners because I remember what it was like to be in that position and how stuck I felt. But you’ve hit the nail on the head by bringing up the fact that there has to be a market for it. Certain course creation sites, for example, have a “build it and they will come” message. Nonsense. Your market might already be catered to by free Youtube videos! True humble leadership coupled with well thought out expertise, offering a track to run on like this is something this ole guy could have used back in 1996, when he realized that our JOB system, back then, let alone today, wasn’t capable of helping him to be accountable for such a large debt, while having any kind of life at the same time; you lead well, Yaro…great post…thank you! Unfortunately at 57, PT employment only, with $530K of debt and growing, with nothing in place for retirement, especially in the line of liquid or invested capital (ZIP), my options are limited to say the least. At the same time, your article reveals that if I want to do take the blog path, using my own ‘self-proclaimed knowledge,’ degree or not, I need to see if there is even a market for it. QUESTION: Could I get away with using a blog from a company like WIX.COM, or do you suggest the BLUEHOST and WORDPRESS platforms…and if so…could you explain in a nutshell. I don’t know anything about wix, but if it’s like Blogspot (Google’s free website builder), it could work. If you go with Blogspot, the only catch is that the name is in your url. www. JohnDoe.Blogspot.com, for example. But you can monetize it with ads. You could also join Amazon’s affiliate program and create your own store (called an “aStore”), which is also free. You’ll get a separate url for your store and it won’t open in a new tab (if someone right-clicks and chooses to, it should… but how many do that?) but you can link to it. There’s an option in building the aStore to allow it to link back to your site. You can write articles and/or reviews, about products with affiliate links to Amazon. I’m not big on the stuff that seems scammy; on my site (a golf site) I only do it with stuff I’ve used or books I’ve read, and tell people When I use affiliate links. I am already a member of the academy, but I must say this blog really opened my brains. For me this was clear, honest and open. when I read not to stay in my head, but go out and see how I could help other people I found my niche. It’s a pretty important realization to have Wim, as you know. So many of my first ideas for businesses were all about me, without really thinking testing or researching to see if other people wanted my idea. Most likely Yaro, you do not meed me to add additional praise on top of the many wonderful tributes you have already received over the years since you started teaching your program. Nonetheless, thank you for a terrific post here: It is so spot on that, how you describe the (actually, my own personal) experience of starting out afresh and fundamentally feeling boondoggled as to what to choose, which way to go, how to proceed, is almost too painful to ponder now having been there at that point after a succession of not so successful attempts to launch an online program effectively since 2010. My first foray into using the web started in 1997 when I registered a domain name and literally “posted my resume and testimonials” online – a method way ahead of, and before, LinkedIn – and since all of my business was actually not online but working directly on site with individual business clients, this served me and my business partner well up till about 2010. Then we tried to launch a new business idea, this time focusing upon developing an active online interactive business development focused community along the lines of creating an “Angie’s List” type business for business people. I hate to think just how much money we have invested in various “Do it this way” “Do it that way” “expert teachers” programs via ClickBank, JVZoo, Warrior Forum, etc., (thought I could look it up in our QuickBooks files) just to figure out how to get this business up and making money but all to no avail. Then, seemingly just in the nick of time, having signed up to alternately explore making a living by subcontracting online to clients looking for subs via eLance, Upwork and Freelancer, suddenly, as if by magic, comes an email from Freelancer, subject “The Internet Marketing ‘Wikipedia’ Is Here” promoting their idea of the “Warrior Vault” and there was this character named Yaro Starak featured and heading the list amongst resources listed as “Influencers You’ll Find Inside “The Vault”. The rest is literally and figuratively “History”, as the saying goes. After doing due diligence and research, listening to all of the Blog Mastermind promotional videos and downloading + reading the Blog Profits Blueprint, I signed up for The Blog Mastermind with confidence that we have finally found someone who really does know of what they are teaching. You certainly were an early adopter to the internet too! I have to say it’s been great seeing your face so regularly inside the Laptop Lifestyle Academy. To me that’s one of the most important sign that someone is taking their own education and business growth seriously. Hey Yaro, First of all, this is definitely an informative post, I’ve seen no place else so far. You’ve shared an insight which was due for all of us. I’ve been in a network of few online marketers who earn millions but never come out and share their experience and key tactics. So, it’s tough to find a right mentor. I am interested in developing and selling a monthly subscription enewsletter on running. What concerns me about doing it via the blog method is the amount of time that will be required ( if i understand blogging correctly ) to post, respond to questions, inquiries, etc., and interact with members. Can I not develop, publish and sell the monthly newsletter, work on the next monthly newsletter and do it that way ? How do you plan to get subscribers to the newsletter?